The Love City Success Story - ZineWiki - the history and culture of zines, independent media and the small press. Issue #4 of the Love City Zine. 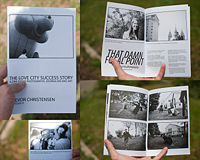 The Love City Success Story (2009 - present) is a photography zine from Provo, Utah. Shot, authored and designed by Trevor Christensen, the Love City Success Story is a quarterly that focuses on photography, journalism and art. A typical issue includes photo essays, critical looks at selected photos from Trevor Christensen's portfolio and philosophical essays about the medium. This page was last modified on 24 July 2010, at 06:10.